The eye’s natural lens is normally elastic and flexible. It works like a camera lens to automatically adjust and focus our vision. This lets us automatically switch our gaze from something near to something far away. Over time, the lens in your eye begins to stiffen. It can’t bend into the right shapes to bring close objects into clear focus. To compensate, you end up moving objects further away at just the right distance to focus. KAMRA Vision is an eye procedure that restores near vision and frees you from the frustrations of reading glasses. The key to KAMRA Vision is the KAMRATM inlay. It sits in the first few layers of the eye known as the cornea. Smaller and thinner than a contact lens, the KAMRA inlay is a mini-ring with an opening -- or pinhole -- in the centre. The inlay uses this pinhole to focus light coming into the eye. This restores near vision while maintaining distance vision. AFTER: With the KAMRA inlay, unfocused light is blocked, making near vision clear. Watch this video to learn more about the KAMRA Vision principle. The key to KAMRA Vision is the KAMRATM inlay. It sits in the first few layers of the eye known as the cornea. 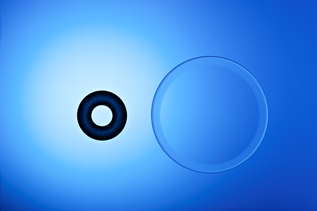 Smaller and thinner than a contact lens, the inlay is a mini-ring with an opening - or pinhole - in the center. This pinhole allows only focused light to enter your eye. The KAMRA inlay is placed in only one of your eyes, allowing you to see up close, while maintaining your distance vision in both eyes. Your non-KAMRA eye is left untouched. Working together, the eyes allow you to see near to far. This is unlike monovision laser vision correction, which corrects one eye for near and one eye for distance and does not last over time. From start to finish, the KAMRA Vision™ procedure will typically take less than 20 minutes. Numbing drops are used to ensure you are comfortable throughout the procedure. You may feel slight pressure while the doctor uses a laser to create a small opening in the first few layers of your eye, known as the cornea. However, it only lasts a few seconds. The inlay is then placed within the opening. Once the numbing drops wear off, your eyes may feel irritated or scratchy and you may also experience excessive tearing or light sensitivity. This is normal. Your doctor will provide medications to help you manage these symptoms. To learn more, watch this short video to an animation of the procedure. You will not be able to drive following the procedure so make arrangements beforehand for a ride home. You should not drive until your doctor tells you that this is okay. As with any eye surgery, healing is a process. Adhering to your doctor's recovery instructions will accelerate your progress. It is important to remember that the amount and pace of near vision improvement varies by individual. While some patients see an improvement within the first week to a month, others may require additional time to heal. Most patients resume normal activities and return to work within 24-48 hours. It is typical to experience some fluctuations in your vision in the first three to six months after surgery. This is often a sign of dry eye or your brain adapting to the new vision. These will likely stabilize. The key to success are to be patient with the recovery process and diligent in following your doctor's instructions. This video contains more information about the KAMRA Vision recovery period. Keep in mind that some KAMRA Vision patients may still require reading glasses for activities such as reading tiny print or reading in low light. In addition, if the inlay is not centered properly or if the effects are not ideal, your doctor can safely remove the KAMRA inlay. Download your copy of the KAMRA Vision Recovery Guide here.